Ending weeks of speculation among Republicans unhappy with their field of presidential candidates and telling his New Jersey constituents, "Like it or not, you're stuck with me," Gov. 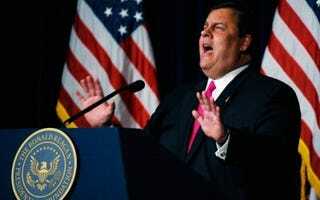 Chris Christie announced Tuesday that he wouldn't be getting in the 2012 presidential primary. But he couldn't resist taking a parting shot — while standing safely on the sidelines — at the man he won't be running against, saying that President Barack Obama was "an example of somebody who has failed the leadership test," which Christie called "the absolute litmus test" of presidential character. It was a Sarah Palin-worthy sucker punch thrown at the president, who — love him or hate him — has stood in the arena while some of his most ardent critics have carped from the bleachers. The CliffsNotes version of Christie's press conference would probably go something like this: "At this time in our history, it's flattering that so many Americans have urged me to take on President Barack Obama, who's so clearly not up to the task of leading the country. I must, however, decline. After all, I can't do it, either." And now we'll never know. Christie might reach the White House someday, but to get there he'll have to beat someone other than President Obama. As he did in his speech last week at the Reagan library (pdf), speaking at length on his "Obama won't lead" theme, Christie declined to offer a specific criticism of any decision Obama has made, but instead used that occasion to remark that "we continue to wait and hope that our president will finally stop being a bystander in the Oval Office." That's pretty tough talk coming from a guy who, by all accounts, spent the last month hunkered down with advisers, trying to figure out how to mount a late entry into the GOP race — only to conclude that "Now is not my time," and that for the next four years, he'll be content to let someone else take a crack at the nation's problems. Never mind that in the last three years, Obama signed the Dodd-Frank financial-reform law; hunted down Osama bin Laden; bailed out the U.S. auto industry; extended Bush-era tax cuts; repealed "Don't ask, don't tell"; tripled the number of women on the Supreme Court; negotiated a $20 billion settlement for Gulf oil-spill victims; sanctioned Iran; pulled the Dow Jones up from 7,000 to 11,000; and shifted the Department of Education's focus from "No Child Left Behind" to "Race to the Top" — a move favored by Republicans, Christie included. By all accounts, Christie was very capable of defeating Obama — with the last Quinnipiac poll showing him leading the president 45 percent to 42 percent in a head-to-head matchup. And regardless of which way you lean politically, it would have been a great race to watch. As I wrote last week, Christie's "size, style, and every-guy persona are the perfect contrast to President Obama. Where Obama is slim, Christie is beefy. Where Obama is reflective, Christie shoots from the hip." But that's done. What matters now is that Obama will be on next year's ballot, and Christie won't. Whatever else a leader is, it's not someone who lobs empty talking points at an opponent while turning down the chance to take on that opponent. Say what you will about the rest of the Republican field — the self-immolating Texas Gov. Rick Perry; Herman Cain, this year's Mike Huckabee; or Romney, the white Obama — unlike Christie, they're all in the ring fighting it out. Christie? He's still the Jersey everyman known for his wide frame and blunt talk. But — at least for now — that's all he'll be known for. Talk.